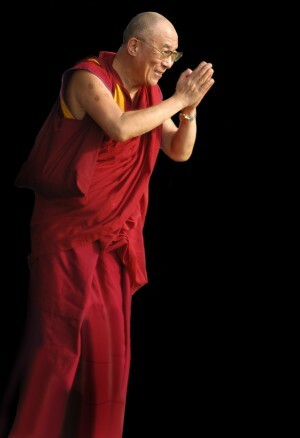 His Holiness the Dalai Lama. Photo by Sirianni. His Holiness the Dalai Lama traveled extensively during April and May. On April 13, he began his three-country European visit in Dublin, Ireland, where he told people to not lose hope despite the financial crisis faced by the country. It was his first visit to Ireland in 20 years. His Holiness spoke on “The Power of Forgiveness” to a sold out crowd at the University of Limerick. On April 15, he traveled to Sweden for a three-day visit to Stockholm and Lund. FPMT center Tong-Nyi Nying-Je Ling in Copenhagen participated in welcoming His Holiness to Denmark, providing volunteers to help at his two public appearances on April 18. His Holiness taught on “Seven Point Mind Training” in the morning followed by a talk on “What Life is all About” in the afternoon. Tong-Ni Nying-Je Ling also had a stand at the event with publications from its group Dharma Wisdoms Publishing as well as materials from Lama Yeshe Wisdom Archive and FPMT. At the end of April, His Holiness visited Japan to express his sorrow for the lives lost to the March 11 earthquake, tsunami and nuclear crisis. He told the Japanese that he is confident that they can “overcome tragedy and move forward to rebuild what has been lost in this disaster. You should not lose heart; you need to face the reality with determination.” His Holiness presided over a mass prayer for the 49th day of mourning at Gokokuji Temple, where over 4,000 had gathered. From Japan the Dalai Lama was to travel to Long Beach, California, arriving on April 30, but due to a sore throat, he stayed in Japan to rest and arrived on May 2. Unfortunately, this meant the Yamantaka initiation and the public talk scheduled for May 1 were canceled. Gaden Sharse Thubten Dhargyeling Center, the event’s sponsor, however, arranged for Khenrinpoche Jangchup Choeden of Gaden Shartse in India to teach during the morning session and for Professor Robert Thurman and Geshe Thubten Jinpa, His Holiness’ translator, to speak in the afternoon. “Jangchup Choeden gave an incredibly clear impromptu teaching on Lama Tsongkhapa’s Three Principles of the Path. And Bob Thurman and Thubten Jinpa had a delightful talk on the context of His Holiness’ work on secular ethics. Even though I didn’t see His Holiness, it was a wonderful event to be at,” said Mandala editor Laura Miller. On May 3, the Dalai Lama picked up his United States tour at the University of Southern California where he spoke on “Secular Ethics, Human Values and Society” to an audience of 5,000. The next morning he received the Shine a Light on Human Rights award from Amnesty International at California State University, Long Beach and then in the afternoon spoke at University of California Irvine on compassion and global leaders. He then traveled to Minnesota. On May 9, His Holiness arrived in Dallas, Texas, where he received an honorary degree from the Southern Methodist University and gave a talk on democracy and human rights to a sold out crowd of 2,500. His Holiness said his approach to promoting human values like compassion and forgiveness is not based on religious belief but developed out of common sense, common experience and through scientific evidence. The next day he met with former Special Coordinator for Tibetan Issues Paula Dobriansky and Mary Beth Markey, president of the International Campaign for Tibet. His Holiness also visited with George W. Bush and Laura at their Dallas home, gave an interview with PBS, and spoke at the George W. Bush Presidential Center. On May 11, the Dalai Lama visited the University of Arkansas in Fayetteville. In the morning, he participated in the panel discussion “Turning Swords into Ploughshares: The Many Paths of Non-Violence.” His two co-panelists were Sister Helen Prejean, the nun and death-row activist who is known for her book Dead Man Walking; and African American historian and scholar of religion and society Vincent Harding, who is also known for his civil rights activism and work with Martin Luther King, Jr. In the afternoon, His Holiness received an honorary degree and spoke on “Non-Violence in the New Century: The Way Forward” to a crowd of over 12,000 people who gave him a standing ovation. From Arkansas, His Holiness traveled to Newark, New Jersey, where he participated in the Newark Peace Education Summit. In a press conference, where he was introduced by Robert Thurman of Tibet House (a co-convener of the summit), His Holiness continued to emphasize his commitment to the promotion of human values and promotion of religious harmony. As part of the Newark Peace Education Summit, the Dalai Lama sat in on panel discussions that included Nobel laureates Shirin Ebadi and Jody Williams; author Dr. Deepak Chopra; Buddhist teacher Roshi Joan Halifax; Rabbi Michael Lerner, editor of Tikkun magazine; 93-year old yoga master Tao Porchon-Lynch; former death row inmate and writer Wilbert Rideau; and many other human rights activists and service providers for communities in need. His Holiness also visited the Newark Museum, which is celebrating the 100th year of its internationally acclaimed Tibetan collection. Photos of His Holiness’ recent appearances are available on His Holiness’ official homepage.